The Hartley Steam Motorcycle/Trap/Car was the invention of a Chicago entrepreneur and it was one of the cars that participated in the 1895 Chicago Times Herald race. The engine was of a rotary design and could be powered by almost any fuel, liquid or solid. The Hartlely Power Supply Company produced a compressed air car in 1897 and a gasoline tricycle oin 1899 before giving up on powered transportation. 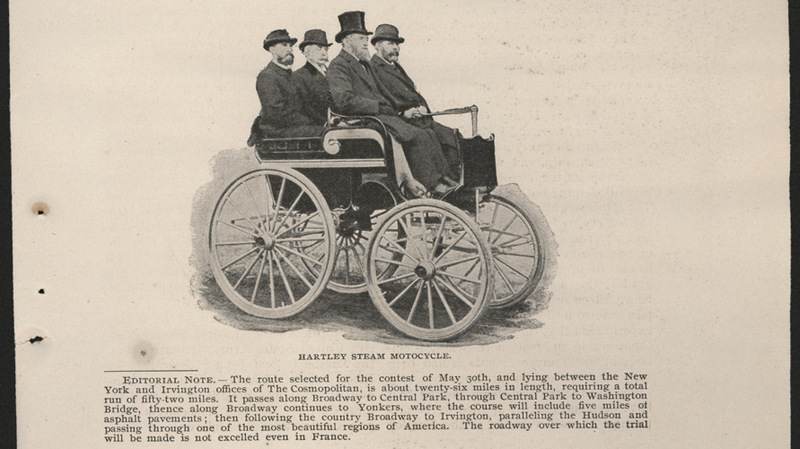 The Hartley Steam Motorcycle as it appeared in Cosmopolitan Magazine in an 1896 article promoting an early New York automobile race. Kimes, Beverly Rae, and Clark, Henry Austin, Standard Catalogue of American Cars, 1805 - 1942, 3rd Edition, (Iola, WI, Krause Publications, 1996), p. 680. Kimes & Clark reference an article in the Chicago Times-Herald, suggesting much additional information is yet to be found.